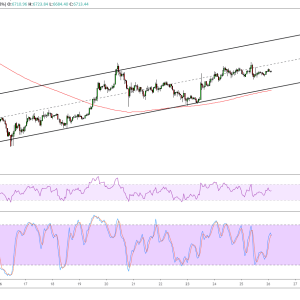 Bitcoin is still trending higher as it formed higher lows and higher highs on its 4-hour chart to create an ascending channel. Price is hitting a roadblock at the channel top and could be due for a test of support again. Applying the Fib retracement tool on the latest swing low and high shows that […]The post Bitcoin Price Analysis: BTC/USD Pullback Support at $5,200? appeared first on BitcoinerX.